One School One Planet is a groundbreaking educational project, emanating from Llanfyllin in Mid-Wales but with a global outlook. Following the success of our first year (2016-17), we have secured funding from Arwain/LEADER and the European Agricultural Fund for Rural Development for a further two years of work on the project! The project simply asks the question: what is our collective vision for Llanfyllin in 2050? Through the lens of the Future Generations Act, the UN Sustainable Development Goals and the Paris Climate Accord, we are looking forward to a world very different from today. With the Trump White House locked down in denial of climate change while the USA is battered by a series of once-in-a-thousand-year storms – a pattern long predicted by climate scientists – we are certainly living in interesting times! Dystopian future visions aside, we are challenged to visualise our own path to a sustainable future, while our governments struggle to lead us out of the quagmire. Maybe it is time to ask the next generation what kind of world they want to grow into? It is perhaps not surprising that the oil funded denial industry has gone into overdrive to try to keep its monopoly alive a little longer, while the world contemplates the almost total shut down of the fossil fuel industries over the coming decades. France, the UK and China are already talking dates to phase out petrol and diesel cars, and electricity from renewable sources is rapidly becoming cheaper than coal, gas and even nuclear. The world is entering a new era! What should we be talking about in our schools and across our communities? How do we prepare ourselves for this scale of change? Businesses, governments and public institutions are going to have to be dragged into the future, because the more rapidly we make these changes the more quickly we reap the benefits and escape the worst ravages of climate change. The leading climate science bodies tell us it is still possible to avert disaster. The destination we need to get to is known. What needs exploring is the path that will get us there. Let’s get creative! Let’s generate a clear vision of how we can do this! One School One Planet proposes that we as a community engage in a collective design process to see what we can come up with. We are kicking off a community scale Permaculture design project which is going to be led by a design team of students from Llanfyllin High School and facilitated by Sector39, the initiators of the project. Over the next 9 months we are going to be releasing the 12 stages of this process, one by one. Everyone will be able to join in and feed their own ideas into the project. Permaculture design breaks down into 12 sequential themes, that lead to a final vision and design proposal. We will be exploring these through 12 cross-disciplinary units to be delivered simultaneously at Llanfyllin High School and online. Solving the climate, energy and economic challenges of the day is going to take some fresh perspective and fresh thinking, and we hope we can contribute meaningfully to this process with this project. The permaculture process asks us to first prepare emotionally and then intellectually for what is coming. We need to be informed, and we need to have a plan. Co-ordinated action is what is required, not a scatter gun approach of unconnected responses. 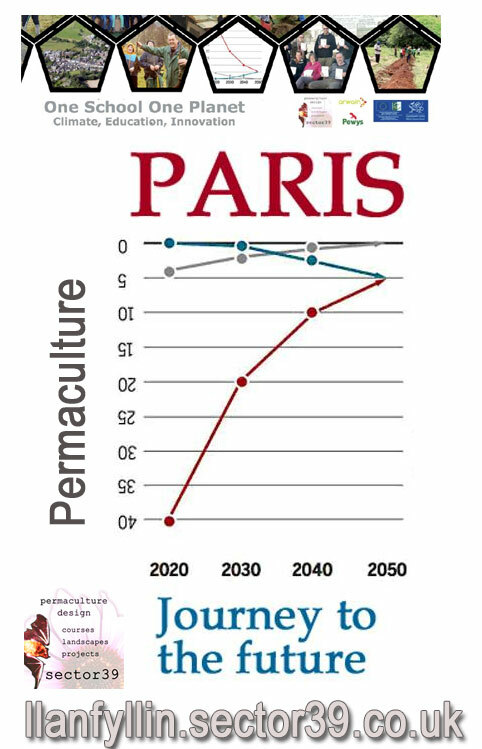 Permaculture design provides that framework, steering ideas and actions into a co-ordinated whole that leads to more resilient and genuinely sustainable alternatives. Join us, regular updates to follow!